The Israeli settlement in the heart of the city of Hebron marked its 50th anniversary this year. Its story is a microcosm of the occupation: contempt and disregard for the rule of law, daily violence, deprivation of Palestinian residents’ basic rights, and a military system that preserves all of the above. This booklet of testimonies intends to offer the public a glimpse of the reality in Hebron from our perspective as soldiers deployed there. These testimonies were given by soldiers who served in the city from 2011-2017. They reveal the violence and discrimination that have become an inextricable part of life in Hebron, and their impact on the lives of Palestinian residents. 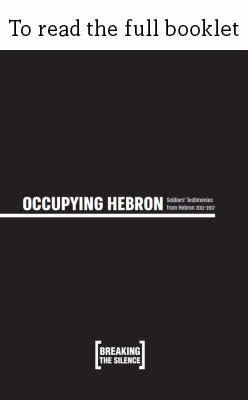 You can also read the testimonies on an interactive map of Hebron. Click on the icon to open the testimony.